Immigration reform “now occupies almost all the Latino policy agenda, sucking up, as one colleague recently put it, all the oxygen on Latino issues,” according to a recent commentary from Angelo Falcón, National Institute for Latino Policy president. Indeed, when Pew Research Center has surveyed the Hispanic community, there are several issues that consistently rank higher on the list than immigration. In 2013, some 57% of Hispanic registered voters called education an “extremely important” issue facing the nation today. That’s compared with jobs and the economy (52%) and health care (43%). Just 32% said immigration. Since 2007, about one-third of Hispanic registered voters have called immigration an “extremely important” issue to them personally. Even among Hispanic immigrants, the share was 35% in 2012. While about seven-in-ten of all Latinos in 2013 said it was important for Congress to pass significant new immigration legislation that year, the share who said so was higher among immigrants (80%) than among the U.S. born (57%). Among the general public, 49% of U.S. adults said so when asked the same question in February. In some respects, Hispanics’ focus on education as a top issue makes sense. In 2010, Hispanics had the highest birth rates—80 births per 1,000 women of childbearing age, compared with 64 for blacks, 59 for whites and 56 for Asians. Fully one-in-three (33%) Hispanics are school age (under 18), compared with one-in-five (20%) whites. The economy has been another top issue among Hispanics, who said the recession hit them harder than other groups. 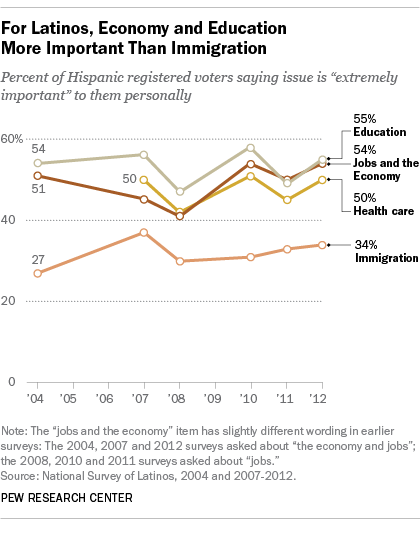 Among Hispanics in 2012, the economy and jobs (54%) ranked about as high as education (55%) as an issue “extremely important” to them personally. The unemployment rate among Hispanics peaked at 12.3% in 2010, compared with 8.9% among non-Hispanics. The unemployment rate for Hispanics has steadily fallen since then (8.9% in 2013), but remains above pre-recession levels (4.9% in 2006).